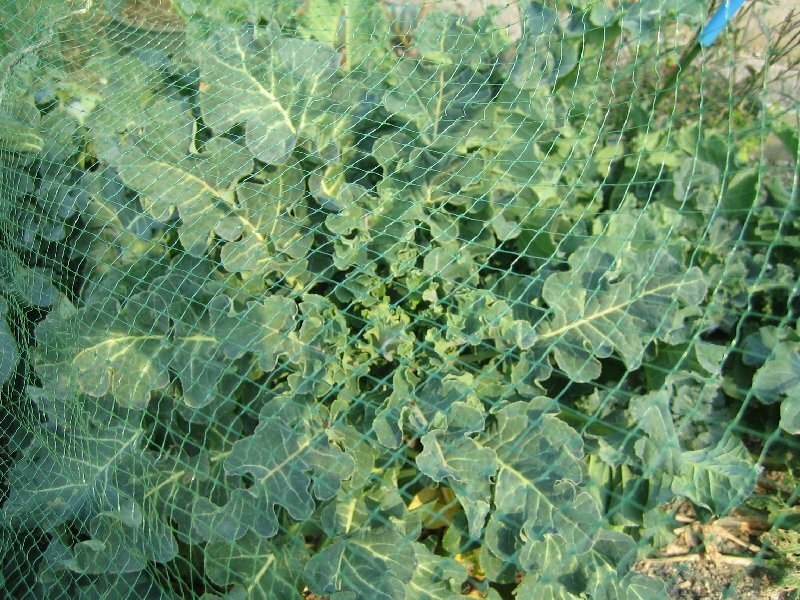 Popped up to see if the purple sprouting broccoli had deigned to sprout. Nothing visible, so I guess I have late PSB. Pity. Then remembered I have one tiny specimen of Rudolph in the middle of the bed, sorted out the stalks to find it, and found the tiniest sprout at the top. Figured I might as well eat it. Not much room for anything else to sprout, but at least I got a garnish for a bowl of rice! Chris was up there, and we had a good chat about various things, and then spotted that the little toerags have been up again and this time have snapped the top off my Victoria plum, so it´s now a foot high bush. Incensed, as it was a very expensive minarette which I don´t think they do any more. The top of the Early Windsor apple´s also been removed, but literally just the tip.Wish they would realise just how much time it takes to grow a tree like that. Bet they wouldn´t like to have anything snapped off them! I suspect that enough damage is now occurring for there to be some very angry tenants at the next Town Hall meeting. Dug some parsnips, which are now sprouting all over the place. Need to get the rest of them out fast before they become inedible. Still not much going on up there. 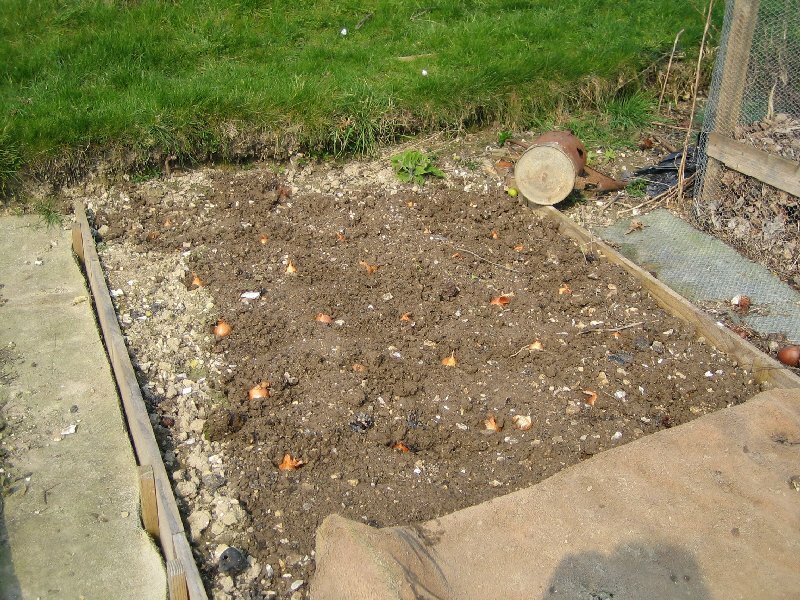 Need to go up with the shallots, but tomorrow I´ve a pond planned at the house. Day off in lovely conditions. Managed to get myself out of the house by midday and stayed up there for 3 hours, during which I planted most of the potatoes and a decent number of shallots. If anything the soil was rather dry. I felt quite good to be up there - there have been suggestions that I might need to give up the plots if I can´t get up as much due to being ill, but there was a good reason why I did raised beds, and it was so I could still garden whatever happened. Right now on top of everything else, had a headache which gradually turned into a migraine. Great. Bright light plus warm day plus feeling grotty. Not good. 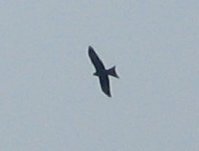 But cheered up by something which is beginning to be a regular sight - a red kite soaring overhead. Have decided on a slightly experimental potato planting method. Instead of digging a huge trench, filling with manure and sticking the spuds in, I drilled a much shallower hole with a bulb planter, dropped in a potato and filled it up with manure, finishing off with a heap of it. That way they´ll grow up through manure and have plenty of food, but I don´t have to risk myself in the digging. And I know precisely where each tuber´s planted! Mused on the fact that it doesn´t matter how much plastic you put down, you always get bindweed in the manure heap. Argh. Managed to get most of my usual varied early tubers in at 1´ spacing, then filled the rest of the bed up with the four novelty coloured maincrops. Then did a double row of Sarpos in the next bed. That needed a bit more preparation, as it was the one that once had the firebox in, and so I had to dig out a fair bit of rock to get the end bit useable. I did fill that up with a proper layer of manure, simply because it was subsoil otherwise. There are the five Anya tubers at that end, already the best chits I´ve got, so they should be ok. The Picasso are the ones still out - very small chits, so can manage to stay out a bit longer. They need to go where the leeks are, so may not get planted for a few weeks. Finally on to the shallots, which just got popped in to the bed where I´d had spuds last year, under the Bramley. Then the head got too much and I had to run for home. Managed to forget to pick up the two compost bins, so after an hour asleep, had to go back to pick them up. Forecast rain for tomorrow, so it is doubtful I´ll get up there, but Friday should be fine. 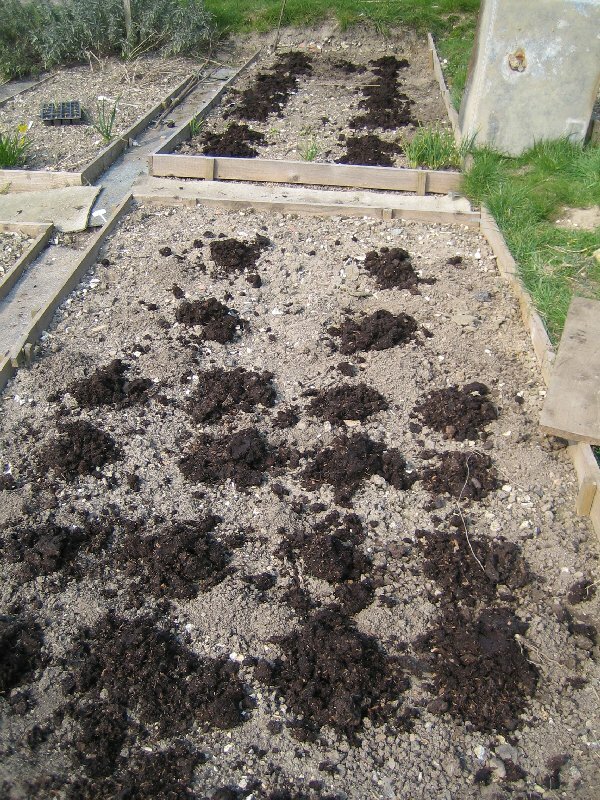 With luck the soil will be softer so I can have a good weeding session. Forecast a bit delayed - yesterday we didn´t get things until hours after initially thought, and today we´re forecast rain all flipping afternoon. But at least I can do an update on the seeds. 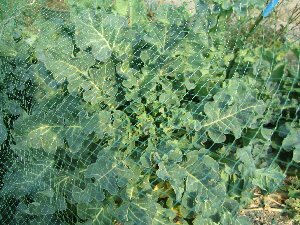 Since yesterday morning, I´ve had 38 minicole cabbages appear. It´s wonderfully cheering to see the little seed leaves pop up. The red ones are all happily growing (slowly!) in the cold frame, as it´s been chilly this past couple of weeks, but they´re tough as old boots. Lettuces starting to appear - beetroots will take a little longer to germinate. I sowed all this lot last Saturday without heat, so they´re doing pretty well! Now the potatoes are out of the way, I´m starting to find places to put new trays of stuff. Just as well. The outdoor tomatoes were due in today, so there´s now a tray of them in the heated prop. Possibly also some progress on my disaster garden, so I´m hoping to have a real home for most of the potting stuff come summer.